Teachers Write: Off to a good start! Last summer I committed to blogging every day of summer vacation. I did that once before too, but am not foolish enough to do it two years in a row. Last summer, I also started, but didn’t finish Teachers Write. I think it was overly ambitious of me to try and do both, so Teachers Write fell by the wayside. 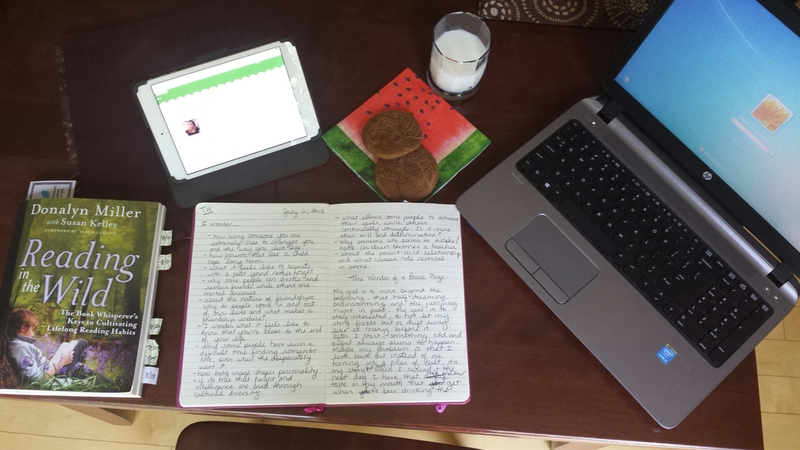 This summer I have three goals: complete Teachers Write, do yoga 3-4 mornings a week and get creative in the kitchen. I think I’ll mostly keep the yoga thing to myself, and you might see some of my kitchen creations here, but I will share much of what I do with Teachers Write. This morning’s assignment was not an easy one, but I’m pleased with what I’ve written. It asked me to examine my goals, commit to them and articulate why I’m writing (my interpretation). My goal is really to finish Teachers Write this time and I hadn’t spent too much time thinking about it beyond that. I know why I write, that one was the easy part. I write because I love to. I identify as a write. It is cathartic to put words to the page. I love poetry. I love story. I love persuasion. I love to share. Also, I write because I teach writing. No one can truly teach someone else to write, unless they have a writing practice of their own. My goal is to move beyond the beginning, that dreaming, brainstorming and the jumping right in part. My goal is to stay interested, to not let my story fizzle out or drift away like so many before it. After I start, something odd and unsettling always seems to happen. Maybe the problem is that I look back, but instead of me turning into a pillar of salt, it’s my story that turns. When I re-read it the next day I have that stale and sour taste in my mouth that I get when I’ve been drinking the day before. While longing for something fresher than water to take the awful taste away, I look back and wonder how the hell I thought THAT was a good idea. Does this happen to other writers? If so, how do they move beyond it? The best solution I can think of is to power through without looking back (too much). So, getting pas the beginning is my ultimate goal. Beginning something that I intend to finish will equal a feeling of success. how losing someone you’re really close to changes you and the way you live life. how parents that lose a child cope long-term. what it feels like to reunite with a past you’d rather forget. why some people divorce and remain friends while others are mortal enemies. about the nature of friendships. Why do people come in and out of our lives and what makes a friendship endure? what it feels like to know that you’re close to the end of your life. why some people have such a difficult time finding romantic love, even when they desperately want it. how body image shapes personality. if it’s true that height and intelligence are bred through cultural diversity. what allows some people to achieve their goals, while other continually struggle. Is it more than will and determination? why someone who seems to dislike/hate children becomes a teacher. about the parent-child relationship and what causes role reversal in some. She has a secret, but she hasn’t told anyone–yet. This is a story about how three women, connected by the bonds of family, learn to love and appreciate each other by sharing their past, being honest about their realities and accepting a practical view of the future. This is about dropping the pretenses and embracing the struggles that make each of these women strong in their own right. This story will cause the reader question how well we all really know our mothers and daughters. I love reading your blog! I look forward to reading whenever you post. You inspired me to start blogging. I would like to blog everyday this summer but, I’m behind already so I think I’ll aim for once a week instead. I can’t wait to read what you post next! Thanks for your kind words. I’ve been enjoying your blog too. Why don’t you do Teachers Write. It’s pretty low key on the commitment and it starts today, so you wouldn’t be behind or anything. Hey Debbie, I haven’t blogged or posted anything for a while and am just seeing this response now. Thanks for the encouragement. How are you making out with Teachers Write?